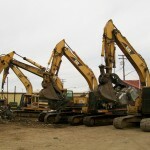 Central California’s Scrap Metals and Recycling Leader, Since 1920! MODESTO JUNK COMPANY has maintained a tradition of leadership in the scrap metal recycling industry and the greater Modesto/Stanislaus community for over 90 years. One of the main reasons behind the company’s industry longevity and success is the people who work at the company. Modesto Junk Company is a privately owned corporation, and is currently one of the oldest established business enterprises in Modesto. MODERN processing equipment and computer technology is used at our scrap metal recycle center. Several aluminum can densifiers and balers are interconnected through a series of sophisticated conveyor belts and materials movement systems. An 80 foot truck scale, 11 smaller weighing stations, a fleet of trucks, forklifts, and metal storage bin containers of various sizes are used to handle your scrap recyclables. Our heavy machinery scrap metal handling equipment includes a CAT excavator with magnet; two CATs with bucket loaders; a LaBounty 70 mobile shear; 20, 30 and 40 yard roll off containers; and four Harris balers — a 2000 model 500 ton baler/logger/shear for ferrous items (the world’s first! ), a 2004 model Centurion and a couple of Badgers (2006 and 2009) for nonferrous. COMPLEMENTING our ongoing redevelopment and equipment upgrades at our scrap metals recycle center are a modern two story office building, large warehouse facility, domestic and overseas loading dock, and rail access. OUR IN-HOUSE DESIGNED computerized scrap metals & recycle center program and professional staff provides for prompt service and pricing priorities of our commercial and industrial customers. Our expert metal sorting personnel ensures that we are big enough to get the job done, yet small enough to care!